Other residents at the apartment complex had hung American and police pride flags outside their rental units, the couple said. 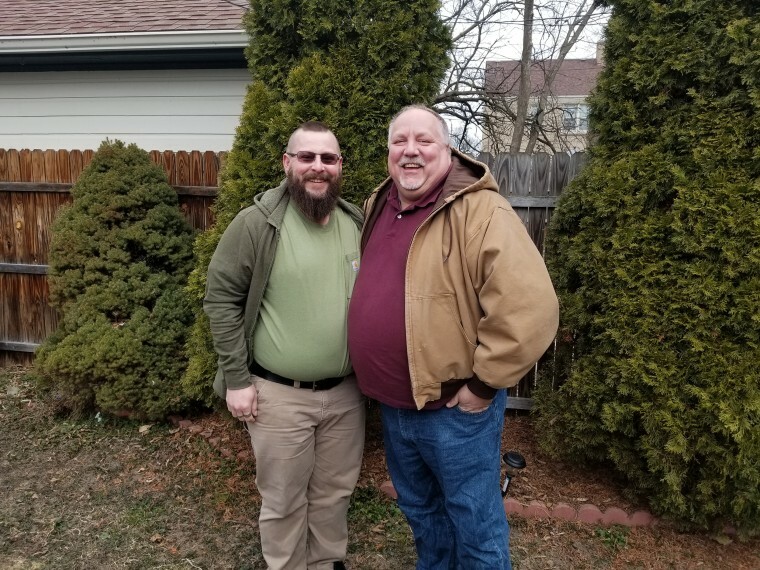 A Wisconsin couple who had been ordered to remove a gay pride flag from their rental property or face eviction are now allowed to keep it. Kevin Kollmann and his partner, Merle Malterer, received a letter Monday from the owner of Country Oaks Apartments in Oak Creek, Wisconsin, saying: "The 5-day notice issued to you last week on March 25th has been rescinded." It added: "No further action will be taken regarding your flag. Your flag may remain." Kenneth Bieck, the chief executive officer of Bieck Management, which owns the apartment complex, also said in the letter that he will be discussing a new policy that allows the flying of flags that "meet certain guidelines such as size, placement, location, etc." "I would appreciate your input into this new policy, so perhaps we could meet sometime in the near future to discuss," Bieck said in the letter. Kollmann told NBC News that the couple had just returned home Monday from drafting a response to the eviction notice they had received last week when they found Bieck's letter taped to their door. The couple, who have lived in their $870-a-month apartment for nearly six years, believed the incident was a case of "selective prosecution" and that they were being targeted because of their sexual orientation. About 10 to 12 other apartments at their complex have American and police pride flags hung from their rental units, according to Kollmann and Malterer. The gay-pride themed American flag that they hung on their patio features 50 white stars and replaces the red and white stripes with rainbow ones. When they spoke with Bieck late last week by phone, they said he told them he wanted the flag removed because it was visible from the management office. Bieck did not return requests for comment by NBC News. Kollmann said he had complied in January with the owner's request that the couple take down a Green Bay Packers flag so as to not appear as though they were advertising for the football team. But they were unflagging this time. "This really means a lot to the LGBTQ community," Kollmann told NBC News on Monday. "Pride and love win every time."